"A concert audience does not come to watch the conductor but to hear the music. A church congregation should not come to watch or hear the preacher but to listen to the Word of God." -- Dietrich Bonhoeffer, cited in a plenary presentation by Rev. Dr. Teresa Fry Brown. 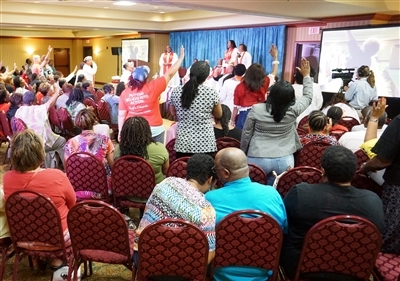 Worshipers stretch out their arms in praise at the opening service of the United Methodist Black Clergy Women gathering in Orlando. Photo by Don Youngs. 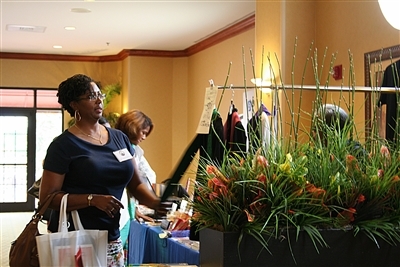 Between sessions of the Black Clergy Women conference, attendees could browse for new Bible literature, robes and Sunday apparel. Photo by Susan Green. ORLANDO – Leading a church is hard work for anyone. But the job may be especially challenging for women of color. Even so, clergywomen should be true to themselves, in the pulpit and elsewhere, said Rev. Dr. Teresa Fry Brown, a professor and director of Black Church Studies at Emory University’s Candler School of Theology in Atlanta. “God wants your voice like it is,” Fry Brown told an audience of about 120 who came from across the U.S. to attend the United Methodist Black Clergy Women conference at an Orlando hotel. She spoke Tuesday, the second day of the five-day gathering. 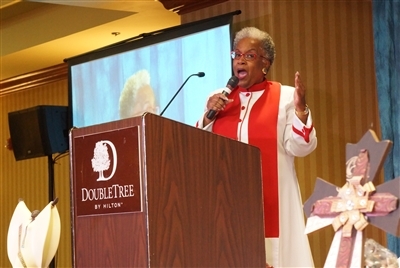 The event included worship, workshops, fellowship opportunities and plenary sessions that focused on a theme of “Shaping Destinies and Impacting the World.” Retired Bishops Violet Fisher, who served the New York West Area, and Linda Lee, who served in Michigan and Wisconsin, led Bible study sessions. On the program from the Florida Conference were Rev. Dr. Sharon Austin, Connectional Ministries director, and Rev. Juana Jordan of Harris Chapel UMC, Fort Lauderdale, leading workshops in managing ministry and home life. Rev. Harold Lewis Sr., Justice & Multicultural Ministries director for the Florida Conference, was a guest speaker. Rev. Candace Lewis, a Florida Conference member serving as Path 1 New Church Starts director for the General Board of Discipleshp, was a facilitator. Attendees also packed meals for Stop Hunger Now, a nonprofit relief organization founded by Methodists that distributes low-cost, high-nutrition meals in Haiti and other impoverished nations. Fry Brown, an elder in the African Methodist Episcopal Church who has preached for more than 30 years, regaled the crowd with jibes at clergy who rely on gimmicks, see themselves as the focus of the church or shirk their duty to base their leadership on the Bible. Above, Rev. Dr. Teresa Fry Brown of Candler School of Theology in Atlanta speaks on the opening day of the United Methodist Black Clergy Women meeting. Below, more than a dozen clergy members from the Florida Conference attended the gathering. Photos by Don Youngs. The modern preaching environment has led to celebrity pastors and even a TV show titled “Preachers of L.A.” It includes distracting opportunities, such as holographic sermons and the ability to interact with listeners from the pulpit via text message or tweet, Fry Brown observed. “People can tweet you and you can change and answer questions in the middle of your sermon,” she explained. It’s important to keep up with current events and look to the Bible for guidance, Fry Brown said, and it’s important to be authentic in preaching. Pastors, particularly those in cross-cultural appointments, must find ways to do that while being sensitive to differences of opinion, she said. African American women should resist trying to preach like men or anyone other than themselves, Fry Brown said. However, they should sit down with and listen to people in their congregation and craft sermons that speak to everyone. “If you’re going to be a transformative preacher, you’re going to have to include all people,” Fry Brown said. Rev. 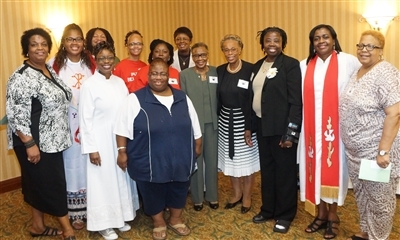 Joyce Timmons, pastor of Bethesda UMC in Kingstree, S.C., said the gathering offered a good mix of opportunities to connect with others facing similar challenges and ideas for practical application of ministry tips. She said it was particularly useful in helping pastors tailor their ministry to the setting they find themselves in. She has been a pastor since 2001 and recently began serving a new appointment in a rural community. “It (the BCW conference) just makes you think about what you should be doing or not doing,” she said.